Our liturgical celebrations throughout the entire year is a participation in the Paschal Mystery, the life, death and resurrection of our Lord Jesus Christ. That’s easy because we have the stories of scripture to guide us. But our celebration today is unique. 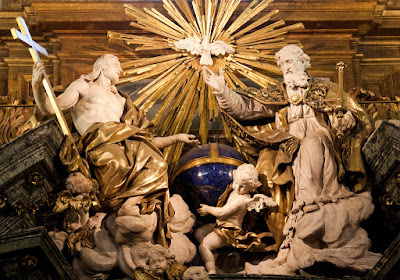 The Solemnity of the Most Holy Trinity is an invitation to enter into the mystery of God. That’s a tall order – to attempt to contemplate the Invisible Deity, to comprehend the Incomprehensible, to penetrate the mind of the Impenetrable mystery of God. Seems impossible and it is humanly impossible but this is the wonder of God revealing His true nature to us. How could we love that or whom we do not know? So, God goes out on a limb and takes the risk of revealing His inner life to us, fully aware that our tiny brains will never be able to fully grasp the breath and length and depth of what He wishes to tell us. No wonder, the doctrine of the Trinity has been described as a mystery pure and simple – probably the most profound mystery of Christianity…most confusing and misunderstood. The doctrine or dogma of the Most Holy Trinity is not just one teaching among many. It is the Christian teaching of the very nature of God… the core belief, the essence and that great mystery of the Christian faith. The doctrine of the Trinity is a distinctively Christian doctrine of God, something that separates Christians from other religious traditions. People don’t realise how radical this teaching is, that this is completely contradictory in the mindset of the Jews and which led to the opposition against and subsequently the execution of Jesus. Everything a Christian does flows from this teaching, is centered upon this teaching, and leads back to this teaching. Catholics, among all Christians, should understand this. From the moment we were baptised in the Name of the Father and of the Son and of the Holy Spirit – and over and over again throughout our lives, we Catholics continually re-dedicate ourselves to the Trinity as we make the sign of the cross. We profess and in so many ways express it in our liturgies, and daily in our home prayers, day-to-day activities and even sports events whenever a player blesses himself as he steps into the field or when he scores a goal. 2. The Father is God, the Son is God and the Holy Spirit is God. 3. But the Father is not the Son, the Son is not the Father, and the Father and the Son are not the Holy Spirit. While the Holy Trinity might be difficult to explain, God invites us to delve into His depths and discover the immensity and incomprehensibility of His love for us. While I can’t fully comprehend the incomprehensible, I can be loved by it. That is why Love itself is a mystery. Only the lovers themselves would understand their own motivations whilst family members and friends continue to be perturbed. We are loved by the Father, eternally generating his Son in a shared breath of the Holy Spirit, who spreads and creates wherever He comes from and wherever He goes. In every moment, the grace of the Most Holy Trinity calls to me to breathe in the gift of belonging to a family of love whose presence in my life transforms every thought, action and word into a moment of grace…if I have the courage to say yes. The Holy Trinity becomes the very model of marital life, family life, community life, church life, and finally societal life. Yes. Where even a gesture as small as tracing the sign of the cross, can remind us that God has created us for our own sake so that we might share in the exchange of His self-giving love and live as a gift with others. We live not only for ourselves but always for others. The joy of today’s feast lies not in fully understanding, but in fully accepting that we are no longer slaves, but sons and daughters. We are no longer poor, but heirs to the promise. And we are no longer without a purpose, but sent on a mission. Our gift is receiving His love, which leaves an effect on every part of our life and gives meaning to even the most trivial and mundane moments. It is through us, living out our relationships in this mutual self-giving, that the divine mystery is made visible to the world. Perhaps, the world continues to reject the revelation of the Trinity, precisely because we have been bad witnesses – our lack of love and care for the other, our penchant to be selfish and individualistic, our tendency to be overly ambitious and to come out tops. How wonderful it would be if we could only reflect the life of the Holy Trinity instead? That would be our most powerful way of evangelising – not merely through words, concepts and arguments, but simply through the way we live our lives. Today, we should stop and contemplate how God has shared His life with us through the simple things that have the capacity to reflect His glory. “God has revealed his innermost secret: God himself is an eternal exchange of love, Father, Son, and Holy Spirit, and he has destined us to share in that exchange” (CCC, 221). Everyone (and everything has the capacity of mediating the call to the family of the Triune God. And if we don’t lose heart, or our nerves, this call will lead us to a world whose depth of meaning and joy will only grow deeper and correspondingly, we can lead the world to God as He had intended.